Talk about a hummingbird magnet, WINDWALKER® royal red salvia takes the cake. The huge, blood red flowers cloak the plant from late June through October. Unlike previous desert salvias, WINDWALKER® royal red salvia is a larger presence in the garden. At 3-4 feet high and wide, this siren calls hummingbirds from miles away! When Kelly Grummons of Timberline Gardens crossed Salvia microphylla ‘Raspberry Delight’ (USDA zone 4) with Salvia darcyi now known as VERMILLION BLUFFS® Mexican sage, this particular seedling stood out from the crowd. It grew bigger and faster, flowered earlier and longer and was winter hardy! Give WINDWALKER® royal red salvia plenty of room. As the stems reach upward, they arch outward, more lax than VERMILLION® BLUFFS. Growing this Salvia VERY dry after establishment keeps it less rambunctious. Plant it in full, hot sun in well drained, rock garden-type soil. A single application of balanced fertilizer in May each year is all it will require to dazzle you for the next 4-5 months! Keep WINDWALKER® royal red salvia more compact by cutting it back around June 1st to about 6-8 inches high. It will branch out and flower at about 2-3 feet in height. Desert type salvias are truly the queens of the dry garden. Visitors to our garden cannot resist stopping to admire the salvias in the heat of summer after the spring beauties have faded. 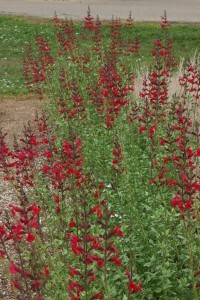 The color of WINDWALKER® royal red salvia, a true crimson, blood red, is an easier color to combine with other flowers. In our garden we have paired WINDWALKER® royal red salvia with apache plume (Fallugia paradoxa) with its amazing white flowers and rusty seed plumes. Nearby is WINDWALKER® big bluestem (another Plant Select® 2015 selection). Its blue-purple blades and burgundy plumes make a perfect backdrop to the crimson flowers of WINDWALKER® royal red salvia. In a mass planting, combine WINDWALKER® royal red salvia alternatively with UNDAUNTED® ruby muhly Grass for a traffic-stopping design. The billowing, copper-red plumes of the muhly Grass soften the bright red of the Salvia. Plant them about three feet apart with the muhly towards the outside of the bed as it is shorter. Desert salvias can be dead-headed in the fall, but don’t cut back the wood stems to the ground until April. Winter watering is not necessary except for the first winter. Thanks to Kelly Grummons, Timberline Gardens for supplying this information. This is a really large, open-growing plant. Blooms later in the season as the hummingbirds are at their peak. I’ve found it to do best when planted amongst other larger plants for support; otherwise they tend to be just a bit floppy for me. where to buy salvia daryci windwalker now that timberline is gone? It shouldn’t be terribly hard to find because it’s easy to propagate. Maybe start looking in mid-late May – be sure to call around first, and I’d start with our member retailers listed in the “Where to Buy” page on this site. I bought it yesterday at Fort Collins Nursery. Can this plant handle a spot that has strong winds occasionally? What might be planted near it (adjacent?) in order to minimize the impact of wind when it occurs? Also, what would you plant with it or near it that would bloom in spring/early summer? I do not have muvh that floeers before June 1st, and I want to create some balance – so that I do NOT have to wait until June/July to start seeing flowers. Maybe a shrub? Or tall flower/ plant? Or even a small flowering plant that could be placed in front of it..? I might even consider a small-ish spring flowering tree, I guess. I do need plants which are humidity tolerant because I live in NC – Zone 7b. We have hot summers and my yard is mostly all full sun. I am trying to move towards drought tolerant plants so that I am not outside gardening daily! The wind will knock these over because they tend to get floppy on their own. I bought cheap tomato braces and after pruning the plants as suggested, the round tomato frames work great! I buy the tomato frames or braces late in summer when on sale. Finding plants that complement the Windwalker are easy. Galardia with it’s yellow and red; yellow, orange or white coneflowers; yellow or orange helenium; yellow, white or orange yarrow; different shades of Asclepias or milkweed are all plants that would be in bloom at the same time and give a very bright flower garden. (If you are looking to soften the brightness of the Windwalker choose flowers with colors of blue, violet and even light pink.Remember the Windwalker is tall. You’ll want something a little shorter in front of it. You ask about earlier bloomers. it’s no trouble finding them at nurseries in the spring. When shopping for any of the above ,or for spring plants, BE SURE to read the labels, especially for what ZONE you live in and the amount of sun and water it needs! Happy gardening! We planted several of these on a burn and they just took off! Beautify and yes, the hummingbirds loves them. People stop and take photos of all the hummingbirds. Full sun and a mister to water. The Colorado Front range. LOTS of strong wind and they still look gorgeous. Planted three of these in a sunny open spot in the spring of 2017. They became somewhat prostrate and I assumed they’d fill in and have more ‘bulk’ the second year even if they needed some support. Flowering was sporadic but the color was really nice. Unfortunately they did not over winter and return for 2018 so rather than try again I think they may be marginally hardy at best in a zone 5 garden. I have it planted with purple Yarrow. The Yarrow is growing around it and gives support to the long stems and looks pretty together. Planted 6 in Spring of 2017 in Kansas City in a protected location. Almost No bloom in 2017. Lost 5 out of the six over the winter – a dry one and including a few days of minus 10-18 degrees at night which is unusual. I did not cut back. One remaining ‘Windwalker’ is blooming a gorgeous deep red now in late October, the second year.